A handful of visionary older Americans are experimenting with alternative ways of living. Unwilling to be dependent on their families , unconvinced that government will sustain them, underwhelmed by the prospect of an indolent retirement, and determined to avoid institutions they see as dreary and expensive, they've been brainstorming: What can we do to give ourselves the kind of old age we want? Use the menu on the right to view four of the resulting innovations: a cohousing community built from scratch in Abingdon, Va.; a "village" of interdependent neighbors in Chicago; a shared housing arrangement in White Plains, N.Y. And in Livingston, Texas, a group of RVers has decided that just because they can no longer cruise in their vehicles doesn't mean they have to abandon them. Call it do-it-yourself senior living. 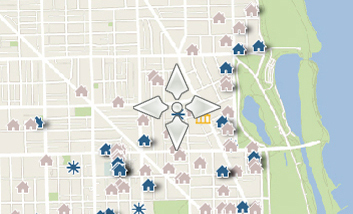 Click the image above to take a tour through a month in Lincoln Park Village. Lois Stack planned to be on a plane to Los Angeles in less than 48 hours, for her daughter's baby shower, when her 77-year-old husband slipped on ice, broke one wrist and sprained the other. Stack, 63, felt overwhelmed: If she wanted to make the trip, she'd have to quickly find someone competent and affordable — and trustworthy — to help her husband cook, shower and eat while she was away. She called Lincoln Park Village, an organization for seniors in her Chicago neighborhood. The next day, a home-care aide from Relief Medical Services, an agency the village had vetted and recommended, came to her home. Because the Stacks were members, they paid 14 percent less than they would have had they approached the agency themselves. "If I had to start in the phonebook, I would've missed my daughter's ceremony," says Stack. "It was heaven-sent help." Seniors in the Chicago neighborhoods of Lincoln Park, Lakeview and Near North can call the village for whatever they need — a ride to a doctor's appointment, someone to change a light bulb, assistance with Medicare paperwork. A two-year-old nonprofit serving 230 members in 165 households, Lincoln Park Village was organized by older adults who want to age at home. More than 60 such villages, modeled on Boston's decade-old Beacon Hill Village, have formed across the country, with a hundred more in development. "Having a support system that can get you the services when and if you need them, but get them at home, seemed to make a lot of sense," says James Zartman, 83, a Lincoln Park founder who has lived in his two-story home for 52 years. The great majority of older Americans share Zartman's wish to age in place, a 2010 AARP study found. But many are forced out prematurely because they can't fix a leak or drive to the supermarket. For them, the village serves as an all-purpose matchmaker. Lincoln Park members, who must be over 50, pay an annual fee: $540 for individuals and $780 for a household of two. Those with incomes below $50,000, a fifth of members, belong to the village's member plus program. They pay a reduced rate, as low as $100, and receive a credit toward any expense. From its small office with two staffers and a clutch of volunteers, the village provides referrals to approved services — home-care agencies, handymen, attorneys, financial managers — that often offer member discounts. The village also collaborates with institutions, like Rush University Medical Center, where members can schedule appointments with specialists or receive counseling. Help also comes from fellow members and student volunteers. Member Wally Shah routinely drives others to doctor's appointments; a DePaul University student helps a 68-year-old with her unwieldy paperwork; a 50-year-old member and librarian makes "friendly visits" with a retired librarian in her 70s. "The village is more than just providing services," says executive director Dianne Campbell. "It's beginning to weave a web of relationships and new friendships." 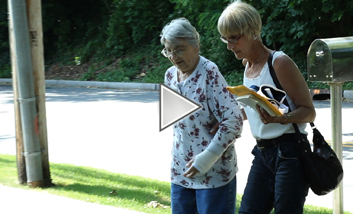 Mary Haughey, 90, for instance, attends the village's tai chi classes, takes walks with volunteers and stuffs envelopes at the village office. "The village offers my mother stimulation and companionship, and it offers me peace of mind," says Haughey's daughter Michal Brown, who lives an hour away. Across the country, villages have mushroomed primarily in moderate- and upper-income neighborhoods. Most charge an annual fee of $400 to $700, according to the national Village-to-Village Network. If they are to become cost-effective solutions for an aging population, advocates say, they must penetrate more diverse communities. Questions have also surfaced about the sustainability of villages, which are dependent on donor dollars and membership dues. Founders have been surprised at how difficult it has been to expand membership. "People say, 'I don't need it now, I'll join it when I do,'" says Lincoln Park co-founder Zartman. "But in the interim, the village will have gone down the tubes because nobody supported it." Lincoln Park needs 350 households to be sustainable, a daunting target, says its treasurer, Bob Spoerri. Last year, it expanded its potential membership by merging with a struggling village nearby. Meanwhile, even established villages have seen their memberships plateau or drop during the recession. Beacon Hill, for instance, has fallen from 450 to 376 in the last three years. "Membership money is not enough," says Candace Baldwin of the Village-to-Village Network. Her organization has begun exploring the possibility of public funding, a tough sell in an economy where "the government doesn't have the money for government," says Joyce Gallagher of Chicago's Agency on Aging. Lincoln Park is mulling whether Chicago villages can share costs — rent, printing, marketing — while maintaining their neighborhood identities, a model currently being followed in Marin County, Calif.
"We'll find a way," vows Campbell. "It's a part of the social fabric, the neighbor-to-neighbor connection that needs to be rebuilt in America." Click the image above to experience life inside a shared household. In late spring, 81-year-old Anna Novak got up to use the bathroom in the early hours when her feet stopped cooperating with the rest of her body. She fell, hitting her head and left arm against the bathtub. "Antimina!" she yelled. Antimina Garmley, the 65-year-old retired nurse who has lived with Anna Novak since July 2010, was sleeping in the next room. She jumped out of bed and ran into the bathroom. Kevin Novak, about to get ready for work, heard his mother scream, and hurried across the hall. Anna Novak had broken a finger, dislocated her wrist and gashed her left eyebrow. Her son picked her up off the floor and Garmley bandaged her head before driving her to the hospital. Kevin Novak, a sewage treatment technician, went to work as scheduled. Garmley and Anna Novak had met through a home share program for seniors at Westchester Residential Opportunities in White Plains, N.Y., which matches senior homeowners with people of any age looking for affordable housing. When Garmley approached Westchester Residential Opportunities, she was looking for an apartment, but she grew intrigued when the agency suggested a home share. At the same time Kevin Novak, 43, was increasingly concerned about leaving his mother at home alone. Feeling isolated, she had moved back to White Plains from rural upstate New York a couple of years earlier. Kevin had been in and out since then. She grew anxious in his absence and complained of being lonely, and her son, constantly worried that she would fall or forget to take her medication, felt compelled to check up on her often. He contacted Westchester Residential Opportunities in search of a companion for her. Garmley and Kevin Novak met for lunch before speaking with Anna Novak at her home. When Garmley moved into the spare bedroom in Anna Novak's house in White Plains shortly thereafter, the effect on the older woman's mental health was immediate. "I used to be very down and out, worried and depressed, and I'm not so depressed when she's here with me," she says of Garmley. "Because I know she can do things I can't do." Of people over 65 years old, 27 percent live alone, compared with only 10 percent of the total population, according to the 2010 Census. Annette Leahy Maggitti, co-president of the National Shared Housing Resource Center, says that interest in shared housing has grown since the economic downturn. A similar program she runs in Baltimore matched 102 pairs in 2010, compared with 49 in 2008. HomeShare Vermont, another prominent matching service, reported an increase from 54 matches in 2008 to 76 in 2010. The most common reason seniors give for renting out a room is financial, Maggitti says. But she adds that older people, some living alone for the first time, feel happier and less anxious after a home sharer moves in. Simply living with someone who can drive, do household chores and provide simple caregiving can help seniors remain independent longer. Garmley drives Novak to doctors' appointments, cooks dinner, does laundry and helps Novak remember her medication. "The main thing is being a companion," Garmley says. "And being here to do things for her, like going to the drugstore. Just being able to watch TV with her and talk about what is in the newspaper." The two women's relationship sometimes resembles a nurse and patient, sometimes family. Garmley, whose mother died when she was young, refers to Novak as "mother." Novak says they have been mistaken for sisters when out shopping. They argue occasionally. Interpersonal relationships often pose the greatest challenge for home shares, Maggitti says, particularly since seniors may have never lived with roommates. "The homeowner has to realize that there is some compromise on their part, some loss of privacy," Maggitti says. Other challenges include municipal statutes that discourage unrelated people from living together, lack of knowledge about home sharing and a stigma against renting out rooms. But since Anna Novak fell, she needs help putting on a shirt, getting down the stairs and buttering her toast, and Garmley's assistance has become even more important. "I would be lost without her," Anna Novak says. Click the image above to take a panoramic tour through the ElderSpirt community. When 86-year-old Carol Edwards returned home after rotator cuff surgery, her right arm in a sling, she couldn't bathe, make her bed or fix a meal. She lived alone with no family close by, but the thought of a six-week recuperation didn't faze Edwards. She lives in ElderSpirit, a cohousing community in the Appalachian town of Abingdon, Va.
An 89-year-old neighbor helped tackle Edwards' morning chores; another resident shuttled her to doctors' appointments; several brought home-cooked meals. "My every need was taken care of," says Edwards, who has lived in ElderSpirit from its inception five years ago. "That's the kind of care you can't get from places that are professionally run." Continuing care retirement communities and assisted living facilities hold no appeal for residents of ElderSpirit, an eclectic group of 44 older adults, including a retired teacher, nurse, artist, minister, corporate executive and several nonprofit administrators, who moved here from 15 states across the country. While anyone over 55 can join the community, most residents are in their 70s. They see senior cohousing, which has also taken root in three communities in California, Colorado and New Mexico, as a low-cost alternative that allows them to remain independent while living in with neighbors who know one another, share weekly meals and help in times of need. "I didn't want to be lonely and useless and helpless in my old age," says founder Dene Peterson, 82, who displays a "Well behaved women rarely make history" sticker in her living room. "This takes care of all those issues." And, she adds, with mutual support and perhaps hired help, people can die at home: "I expect to." 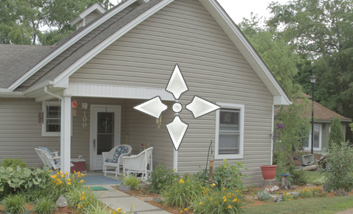 Built on 3.7 acres, ElderSpirit is a cluster of 29 gray and white residences flanked by a Spirit Center, where members congregate for meditation and prayer, and a two-story Common House, where they eat lunch together twice a week and make consensus decisions at monthly meetings. Since residents live within shouting distance of one another, in what's sometimes called an intentional community, they've come to share their lives in many ways: One group swims in nearby Holston Lake once a week; another has a Friday night Netflix ritual. The community establishes "clearing house" sessions to resolve disputes, and nominates "care coordinators" to check on residents' health. "It makes growing older easier when you're with people who are also growing older," says Nancy Hunter, 74, a former social worker from Alaska. Many residents say they feel younger since they moved in. Most have enjoyed stable health, says Anne Glass, a gerontologist at the University of Georgia who has studied the community since its opening. One explanation, Glass says, is that community members aren't isolated and lead active lives, shown to enhance senior health. With only two part-time staffers, residents manage and maintain the community themselves. Through committees, they clean the common areas, organize exercise programs, draft policies, admit new members and control the ever-so-tight budget. ElderSpirit is a mixed-income development, so more than half the units are state-subsidized rentals for low-income seniors, who pay $325 to $463 a month. The others — one- and two-bedroom condos — initially sold for $100,000 to $130,000. (They now go for $160,000.) Owners also pay a monthly maintenance fee of $150, and if they leave and sell their homes, contribute half the profits to the community. Although multigenerational cohousing has grown to nearly 250 such U.S. communities, senior cohousing, despite residents' enthusiastic testimonials, has been slow to catch on. One reason is the protracted process: ElderSpirit, a product of 10 years' planning, cost $3.8 million, raised by a team of dogged seniors through a patchwork of public grants and private donations and loans. The recession and housing market crash have also hobbled the movement, says Kathryn McCamant, the architect and developer who coined the term cohousing. The 30-unit Wolfcreek Lodge in Grass Valley, Calif., for instance, was poised for construction in 2009, but the group lost its financing and some buyers pulled out when they feared they couldn't sell their homes. After a two-year lull, the group, with down payments from 23 buyers, has acquired construction loans and is set to open next summer. Senior cohousing communities also confront the question of whether the model will hold as residents' health deteriorates. In the last two years, ElderSpirit has weathered several medical emergencies, including a heart attack and a broken pelvis, plus three joint replacement surgeries. Susan Apthorp, 76, who watched the community rally around her after a fall two years ago, acknowledges that someone who developed dementia and needed round-the-clock care might be forced to move into an institution. But, she says, "We'll definitely live in our homes longer than most people do." Watch a short documentary video about life at Escapees Care. Meet some of the the residents of Escapees Care in a photo/audio gallery. In December 1998, Ed Spake, 71, was driving south on Route 105 in East Texas when he suddenly needed to pull over. Ed was driving the van that pulled the 19-foot RV that he and his wife, Rae, had lived in for five years. "What's wrong with the car?" Rae asked from the passenger seat. "I can't see out of my right eye," Ed said. Ed had fallen victim to macular degeneration, a leading cause of visual impairment among older adults. His driving days were over and the following year he was declared legally blind. 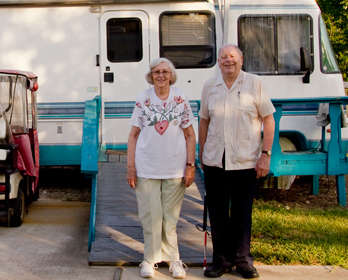 Full-time RVing has become a popular lifestyle for independent-minded seniors. 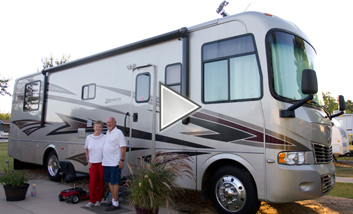 But like the Spakes, full-time RVers sometimes find their bodies get in the way. As the Escapees Club, the country's largest association of RVers, puts it, they have to "hand in their keys." The usual options for seniors who need care — assisted living, nursing homes, moving in with children — were either unattractive or too expensive for the Spakes. So they found a more accommodating option. Just outside a 140-acre RV park called Rainbow's End, the Escapees Club's national headquarters in Livingston, Texas, sits a smaller park with 33 lots: Escapees Care, the country's only assisted living facility for full-time RVers. It is, in many respects, the end of the road. In 1993, the Spakes sold their belongings to travel the country, visiting 35 states along the way and living for months in state parks in South Dakota, Utah and northern California. They saw Escapees Care as an opportunity to get the health care they need while remaining in their RV, surrounded by kindred spirits. "I think of us as an extended family," Rae, a loud, animated woman with a gravelly voice, says in her RV, which is now stationary and connected to a wood-stained deck. For $824 a month for one person and $1,236 for a couple, residents at Escapees Care have access to the Care Center, where registered nurses are on call 40 hours a week. They take regular blood pressure readings, clean and dress wounds, help residents with their medication and schedule doctors' appointments. The monthly payment also covers laundry, transportation and three meals a day in the Care Center's dining room. There is adult day care for those with dementia and a weekly support group for those with low vision. During the latter, Ed Spake usually dozes off on one of the Care Center's plush couches while Rae takes copious notes. More important to most of the 50 or so residents, the community provides a social network, with daily activities like bingo, bluegrass concerts and Wii bowling. For Father's Day, Escapees Care staged a blind golf cart race. Competitors drove their carts, the primary mode of transportation there, around a parking-lot obstacle course of cones, with the passenger as navigator and the driver either blindfolded or actually blind. At Escapees Care, "you're more aware of what life is really like and how important other people are to you," says Ed Spake, who didn't compete. "Whether you can see them or hear them or whatever, it's just enjoyable meeting people." 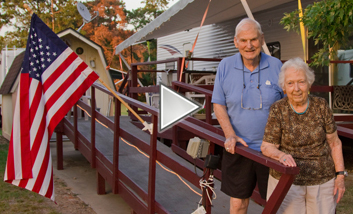 The Care Center is often called "Kay's Dream" after Kay Peterson, who founded the Escapees Club in 1978 as a way to unite this like-minded community; she and her husband, Joe, began RVing in 1970. Rainbow's End and other satellite parks where RVers can establish residency, get mailing addresses and register to vote, soon followed. But Peterson, a former nurse, watched physical ailments drive her peers into undesirable living situations. In 1997, with $170,000 in donations from Escapees Club members, she opened the Care Center. Now, residents' dues cover about 56 percent of operating costs while the rest is paid for with Escapees' donations. "If your situation changes, there's nothing you can do about it," says Peterson, who lives in a detached single-family home at Rainbow's End, her RV parked nearby. "I made up my mind years and years ago that if I ever could, I would start a place where you didn't have to put a bunch of money down." Some older residents, like the Crispells, have, indeed, turned in their keys and no longer drive. Faced with the same question as many older adults — what to do if their health worsens substantially — the Crispells have already decided to seek hospice care in their RV. "We listened to our bodies," Pearl Crispell says. The Spakes still talk about taking more trips while Rae is still healthy enough to drive and if Ed's vision improves, but it's unclear if their plans are based in hope, rather than reality. "You miss the sights and sounds of new places," says Rae Spake, sounding wistful. "There's a lot of places yet to go — if we get there."